A team of local researchers have discovered a previously unknown cellular defect in patients with idiopathic Parkinson's disease, and identified a sequence of pathological events that can trigger or accelerate premature death of certain neurons in the brain seen in this disease. The findings, published in the journal Nature Communications, will provide a better understanding and further research towards a possible cure of Parkinson's disease, which is a neurodegenerative disorder that affects movement and other vital functions in nearly one million people in the United States. Despite advances in understanding the causes of familial forms of this disease, the most prevalent idiopathic form of Parkinson's disease remains a mystery. Boston University School of Medicine (BUSM) researchers discovered that the cells of people with idiopathic Parkinson's disease have a previously unknown defect in the function of a specific PLA2g6 protein, causing dysfunction of calcium homeostasis that can determine whether some cells will live or die. "Idiopathic or genetic dysfunction of calcium signaling triggers a sequence of pathological events leading to autophagic dysfunction, progressive loss of dopaminergic neurons and age-dependent impairment of vital motor functions typical for Parkinson's disease," explained corresponding author Victoria Bolotina, PhD, professor of medicine at BUSM. 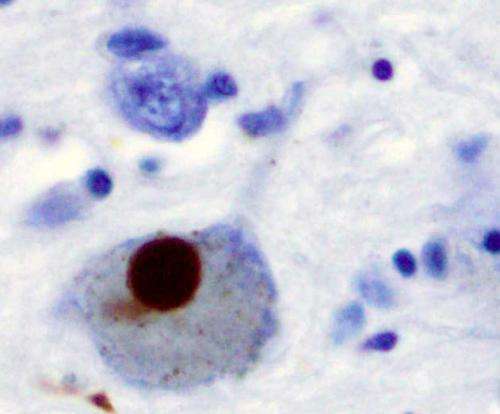 "Discovery of this new mechanism associated with human Parkinson's disease and our ability to mimic this pathology in a novel genetic model opens new opportunities for finding a cure for this devastating neurodegenerative disease," she added.